These are the files used in this tutorial. Create these files in a proj1 directory inside css folder. Create gulpfile.js inside proj1 directory with the following content. Run the following on command line to generate all.css with source map. 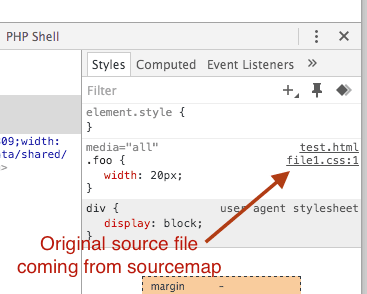 The comment /*# sourceMappingURL=all.css.map */ tells the browser the location of source map. And sourcemap file all.css.map contains the actual source mapping. Create a test html file which uses all.css as shown below.